Chess 2: The Sequel is the next step in the evolution of chess tuned for more viable options, strategic interest, and years and years of expert play. Classic: The original army from classic chess and the only army with a queen. Two Kings: Two warrior kings with a powerful attack and extra move. Empowered: Bishops, knights, and rooks gain each other's movement powers when adjacent. Animals: A wild mix of atypical attacks that are difficult to defend against. Nemesis: Focused attack on the enemy king for those who prefer checkmates. Reaper: Haunted army with teleportation and immortality. The 21 matchups and 36 opening books reward strategy and positional play from the very first move, not rote memorization. If you cross the midline of the board with your king (midline invasion), you win. This makes for faster, more dynamic, and more aggressive games while eliminating the draw problem that plagues high-level chess. 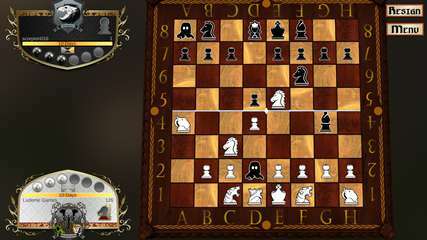 A pleasant, cohesive experience fit for the "Game of Kings"
Play asynchronously in Correspondence mode with 11 days per move for Chess 2 on the go. Live matches have 25 minutes Fischer time with 15 second increment. Cross platform play with OUYA.